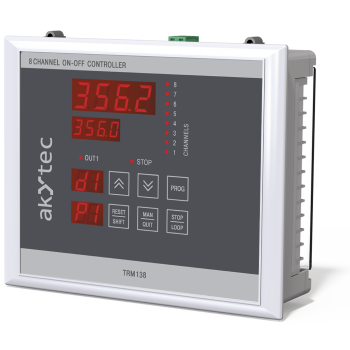 The 8 channel on-off controller TRM138 can measure, display and control different physical process values such as temperature, pressure etc. The 8 channel on-off controller TRM138 can measure, display and control different physical process values such as temperature, pressure etc. It controls up to eight channels and enables the forwarding of measured data for recording and further processing. Measuring and control of different physical values such as temperature, humidity, pressure etc. The TRM138 is used in various fields of industry as e.g. multi-zone oven temperature control, protective and monitoring systems. 8-channel temperature controller can be used for bread production, in multiband tunnel type furnaces, and other process equipment. Alarm switch can be used in the multi-zone ovens for food, metallurgical and other industries. Temperature control and two-stage heating control in technological equipment with up to four heating areas and rapid heat-up: baking ovens, injection molding machines, extruders, etc. Temperature on/off control with one sensor and eight independent settings.